The chemical interaction between the gas and dust in interstellar space can be quite complex. Given the low temperature and pressure of space, one might think that chemical reactions are simple and rare, but as I’ve written about before, the surface of dust grains can act as a kind of catalytic converter that allows complex chemistry to occur. Most of the evidence of this complex chemistry comes from the detection of molecules in interstellar gas clouds. These molecules can be detected by their emission and absorption spectra, so we know they are there. 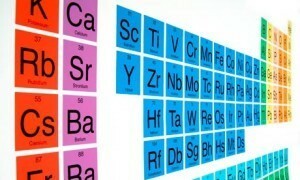 The details of how they form are largely based on Earth-based experiments and computer simulations of chemical reactions. But now a recent paper in the Astrophysical Journal presents evidence of these reactions in space. The authors looked at molecular hydrogen (two hydrogen atoms bonded together) in a nebula known as IC 63. Molecular hydrogen is very common in interstellar space, but it cannot form between hydrogen atoms alone. Instead they need some other molecule or body to take away a bit of their energy so they can chemically bond. It has long been thought that dust grains serve this role. A single hydrogen atom adheres to the surface of a grain of interstellar dust, then another hydrogen atom adheres to the surface. The two hydrogen atoms shift along the surface until they meet each other. They then bond to form molecular hydrogen and release from the dust grain. When the hydrogen molecule pushes off from the dust grain, it’s like a burst of gas from a rocket engine. As a result, the dust grain is caused to spin rapidly. This process is known as a Purcell rocket, after Edwin Purcell who first proposed the idea. As the dust grain spins rapidly, any static charge on grain (which is common) will create a magnetic field like a small magnet. This will cause the dust grain to align with the magnetic fields of interstellar space, similar to the way a magnetized needle will try to point north. At least that has been the theory. Now if this is right, then regions where molecular hydrogen is being produced should also be a region where dust grains are aligned with the magnetic field of interstellar space. This is exactly what the authors found. They first looked at the distribution of molecular hydrogen in IC 63, but then they looked at light coming from more distant stars and passing through IC 63. Specifically, they looked at the polarization of the starlight. Polarization is an orientation that light can have. If the dust grains of IC 63 are all aligned in a similar direction, then the starlight passing through the nebula should be polarized in the same orientation. You can see the results in the figure above. 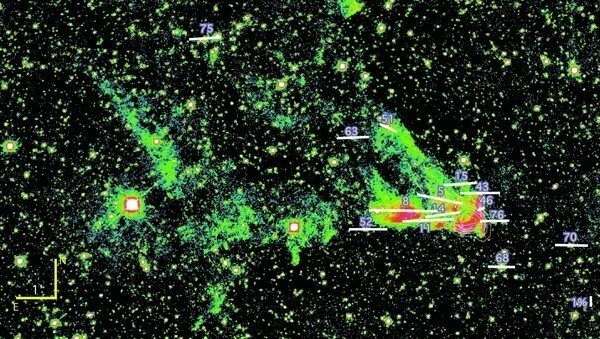 The green and red regions are where molecular hydrogen is being produced, and the white lines show the polarization of starlight passing through the nebula. As you can see, the lines are aligned in the region where molecular hydrogen is most prominent. This is exactly what the Purcell rocket model predicts. So with a little rocket science we can see astrochemistry in action.